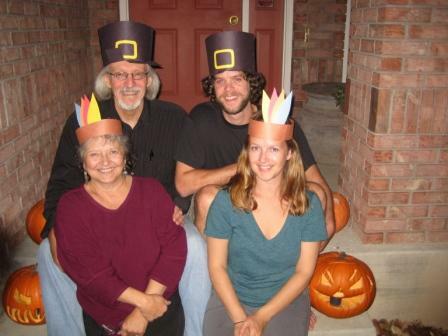 This Thanksgiving is the first of many holidays that we will spend abroad and away from our families on this journey. It’s not, however, the very first holiday I’ve spent abroad (Thanksgiving in Florence, 1999 springs to mind…what a feast that was, and a story for another time), so one thing we know already is that the holiday is about your own acknowledgement and celebration in whatever way works for you. I happen to LOVE Thanksgiving, in fact it might even be my favorite holiday. The food is a huge part of it, but the other part is about really taking time to reflect on your blessings, and to acknowledge the gifts that the universe has granted us in this life. Before we left we celebrated an early Thanksgiving (on Halloween), and tomorrow will we celebrate again with friends in Santiago, Chile. At this moment I am grateful for two turkey feasts in one month! In all seriousness though, we are thankful for so many things. We have loving and supportive families. We have the opportunity to travel and follow our dreams. We have each other to share this journey with. Who do you know in Chile with an oven? And do they have turkeys there? Happy Holiday! Somehow I didn’t realize you commented on this until now! I have a friend from middle school who lives here with her Chilean husband. We have the luxury of staying in their apartment, and yeah, they have big frozen turkeys at the grocery store. We even found marshmallows for the sweet potatoes!